Greg made this beautiful guitar for me in 1996 and showcased it at the Healdsburg Guitar Makers Festival in August, 1996. 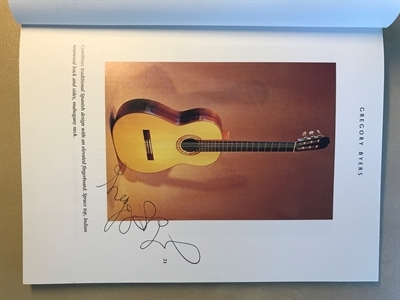 The first picture, taken from the festival softcover book The Luthier’s Art, shows this very guitar with a brief description and Greg’s autograph. Traditionally braced European spruce top, Indian rosewood back and sides, elevated fingerboard, 650 mm scale length, Greg’s well-known intonation setup, Sloane tuners with real mother of pearl buttons, double-hole tie-block. Local sale only. You may try it at my home in Oakland, California. Contact: Email Clyde Sugahara at csugahara@att.net for more information.